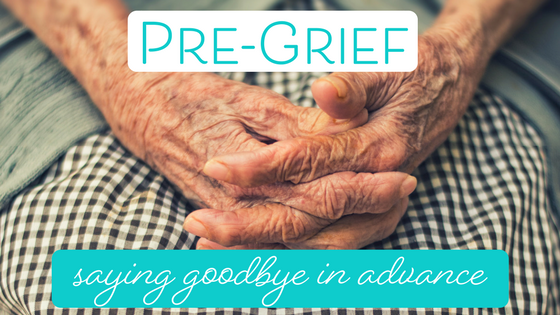 Pre-grief is also called anticipatory grief. It essentially means having a grief reaction before the loss has actually occurred. Pre-grief is the sadness we feel when we experience the passing of time with our loved ones. People who were once so vibrant and full of life, become vague, forgetful and /or their senses fail them (eyesight, hearing). They are still with us, yet not the same. And so we experience a sense of grief for the person they were and who they no longer seem to be. That person who is now lost to us, yet physically they are still here. We mourn and miss the person they were, whilst they are still alive. Pre-grief feelings of pain and loss can also come about from imagining what life will be like without our loved one. This is particularly the case when our loved one is sick or dying. We can experience pre-grief in many different relationships. A grandparent, an elderly friend, your own parent or even your child - can all trigger pre-grief. A couple of years ago, I travelled with my immediate family to England to visit my surrogate grandparents. Unlike regular grandparents, I first met my surrogates as an eleven year old in the late 1980's, with my parents and siblings. We had stayed with them in the Cotswolds area of England, and enjoyed their hospitality. The bond between the families was strong and old. Back in 1960, their family had lived opposite my mother and her family. They were neighbours in Sydney for just 12 months. Yet nearly 30 years later, we were visiting them. My maternal grandparents had both passed away only a few years earlier, both very young. Yet over all those years, the two families had kept in touch via letters and Christmas cards. It was and is a powerful friendship. In the mid-1990's, as an eighteen year old on my gap year in the UK, I visited them again. I loved them both dearly, and they were role-models of a loving, long-lasting relationship. They finished each other's sentences, laughed together and clearly adored each other. They were everything I imagined my maternal grandparents had been, if only I'd known them for longer, and as an adult. Feeling a little homesick for my family back in Australia, but also relishing their company and love, (and the history between our families) I asked, somewhat cheekily, whether they would be my surrogate grandparents. To my delight, they agreed! Through that year I visited them two or three times, and we kept in touch with letters and the odd phone call. A few years later, when I was 24 years old, I returned to the UK to visit them again. Once again enjoying spending time with them, hearing their stories and loving their company. More years passed, and I wanted them to meet my husband. So, we planned our honeymoon in Europe so could visit them. And then two years later, we were back again to see them and stay for a couple of days. Many years passed. We were busy with new babies, new homes, baby loss and all the changes that come with these milestones. And so, it came to September 2015. It was the 10th anniversary of our last visit to my surrogate grandparents, and it felt necessary to plan a trip to see them again. I wanted them to meet my boys. And in the recesses of my mind, I also didn't want to wait much longer 'just in case'. And so, in April 2016 we found ourselves once again driving the A40 towards the Cotswolds; towards my surrogate grandparents. We were all excited - my husband was keen to see them again too, as we'd shared many an evening of fine food and laughter with them over the previous visits. The boys were excited as they had heard so much about these surrogate grandparents, and loved the story of the ghost in the house - as I'd been told on my first visit as an eleven year old. The visit was lovely. But not what we had anticipated. The 10 and half years that had passed since our last visit had, of course, resulted in significant changes. Whilst they both still looked the same, deafness and dementia was winning with my surrogate grandfather. My surrogate grandmother was reasonably well now, but had experienced a lot of sickness through the previous winter and had early stage dementia too. We stayed in the nearby village and visited them multiple times but for only short intervals, as it was clearly very tiring for them to have visitors. I enjoyed the time with them, and loved seeing them both. But also felt incredibly sad. Sad that this would most likely be the last time I would see them. Sad that ageing was so hard on these wonderful, vibrant people. Just sad for all that was passed, and all that would no longer be. As we drove away, silent tears slipped down my cheeks and I felt hollow. I knew this feeling well. Grief. Pre-grief of course happens when we say farewell to a loved one who we imagine or know we may not see again, as I have shared here. But we can also experience pre-grief in other circumstances and at times of other life transitions, and at other stages of our life. Pre-grief does not always involve the loss of a person. As mother's, it can appear in a slightly different form at milestone moments for our children. There is not the loss of a person, but the loss of a time, or memory. The sadness you feel when your child starts school, or heads off on camp, or away to college; each of these milestones act as a reminder that your child, whilst forever in your heart, is not yours to keep. They grow up, move on and out into the world. The feeling of sadness at these times could be pre-grief. Pre-grief can also appear when we are making changes in our lives. Moving house, changing jobs, switching career direction, moving cities, facing divorce or losing your job. In each of these transition times, it is natural to experience a sense of loss and grief. What is often not acknowledged is that we can feel the sense of loss well before the change has occurred. In these times, the pre-grief can be just as intense as the grief we will experience during or after the event, transition or change. Pre-grief, and the sorrow that comes with it, is a form of grief. It just isn't talked about as often. But, like every other type of grief, it takes time to process and time to heal. Grief is not a linear experience, and neither is pre-grief. One moment you can feel fine, and the next be crying uncontrollably. This is normal, and part of the grief process. Like the grief process, there is no time frame or guide for when you should be 'done'. Acknowledging the fear, anxiety and loss you are feeling as pre-grief, and that they are a normal part of grief, is a big step towards understanding your own emotions. Additionally, knowing the emotions you are feeling are grief, whether they are felt for a person, role or place, can assist with ensuring you seek appropriate and timely support. (As always, if you are feeling deep sorrow or depression as a result of your grief and loss, please seek the support of a registered professional). Despite the upset and pain of pre-grief, it can have some benefits. Through experiencing grief in advance, family members can prepare for what will occur after death, presenting us with the opportunity to spend time with our loved ones and convey our love. Pre-grief can also help us adjust to the loss, and learn how to let go. If you have experienced pre-grief, grief or loss, I'd love to help you. I support people who have been through major life transitions (including loss and grief), to rediscover the joy in their life - and I'd love to help you! Book in for your complimentary consult and we can chat about how we can work together.